Ever since we lost our good friend Mr.Cuckoo (the name brand of our rice cooker) a few months ago, we never have any leftover rice (which is ideal for fried rice). And since my futile attempts at fixing Mr.Cuckoo had reached its end, we had to make new rice and let it cool for a few hours (otherwise being too mushy for this recipe) to make our shrimp fried rice. 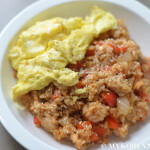 For those unaware of Korean fried rice (and fried rice in general), it serves several effective purposes at once: it is a smart way to use up leftover rice and vegetables, provides a change of pace from plain, sticky rice that Asians eat every day, and is quick and relatively healthy compared to other foods made this quick and easy. 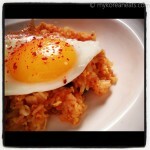 Although we haven’t made too many fried rice dishes in the past, we will continue to make more variations like this. We learned from a “friend of a friend” to try some butter and oyster sauce as the base (sounds like an odd combination huh? ), and we were totally surprised how similar it was to the real thing served in most Korean-Chinese restaurants. 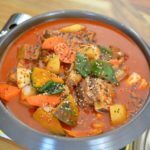 The ingredients all worked well together, the taste and texture were spot on, and there were no complaints other than wanting more. If I were to do something different next time, I would replace the small shrimp with larger ones to give the dish more substance. I can’t wait for our next fried rice meal. 1.In a skillet or non-stick frying pan, heat 1 tbsp olive oil and stir fry the “hard” vegetables first–diced bell peppers and carrots, 5 minutes. Next add the diced onions, corn, and shrimp to the pan, another 5 minutes. If there is excess water/liquid, discard carefully and set aside on lowest heat setting. Optional: Cooking each ingredient separately (pepper, carrot / garlic, onion / shrimp) to ensure that they cook consistently is perfectly fine, but it will add another 5~10 minutes to your cooking time. 2. In another pan or skillet, scramble 2 eggs in generous amount of oil. When finished, add eggs to the main skillet with other ingredients. Optional: Prepare 4 sunny-side up eggs for the topping/garnish. 3. On low heat, add cooled rice, butter, soy sauce and oyster sauce and mix thoroughly with spoon (wooden works best). Make sure to coat sauce on rice and rest of ingredients well; this will take a few minutes and some hand/wrist strength from continuous mixing. 4. 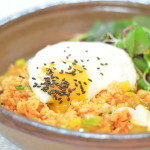 Plate the fried rice topped with a sunny-side up egg. 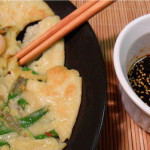 If wanting a semi-round shape (see pic above), stuff fried rice in a round bowl pressing down firmly. Set the bowl upside down on a plate; the fried rice should sit upright in a round shape. 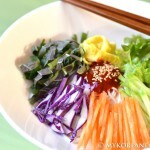 Enjoy with kimchi and other banchan (side dishes). *Some people like to stir fry the ingredients separately because they cook at different times. For fried rice, this can be skipped since the main point is to get them slightly tender; this means cooking the harder veggies (carrots) first and adding the softer ones (onions) later. This will save you valuable minutes in cooking time and the hassle of washing unnecessary, extra dishes.